Welcome to the revised Oppo Census 2016! If as many of you can fill it out honestly (*COUGH* THEHONDABRO *COUGH*), we’ll be able to see all the weird vehicular statistics of this place. 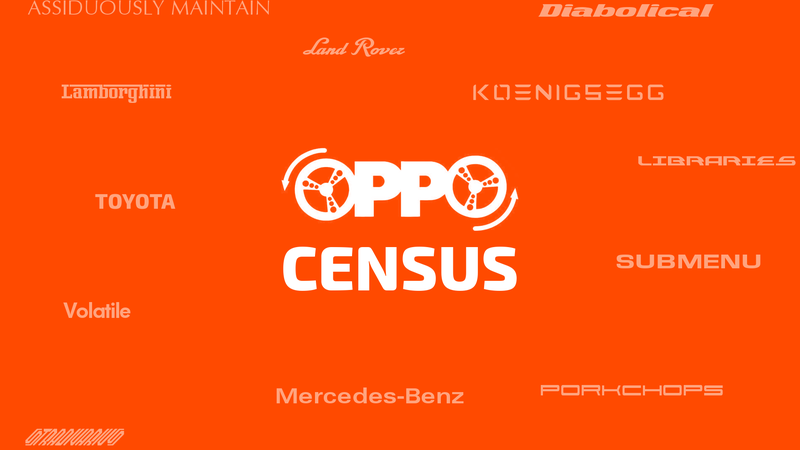 The Oppo Census will ask you a few questions about yourself (don’t worry, you will remain anonymous) and a lot of questions about your vehicle history. This includes motorcycles/scooters/etc. I have grouped motorcycles/scooters/etc with power sports vehicles like ATVs. There are 6 sections, but most of them are short. It’s just for organization purposes. Even if you don’t have or never had a car, feel free to participate. PLEASE FILL THIS OUT ONCE, ACCURATELY. The form will be open from August 29 to December 30 (mainly so more people can answer and I can focus on school and stuff). A results post will appear hopefully soon after the form closes. Thanks to Bman76, BmanUltima, Jarod Rose, Miss Mercedes, and S65 for testing! For the person who asked how to get posting permission, click here!